Frequent Hella Bus readers may be all too familiar with our ongoing failure to adequately fund state government. Thanks in part to the now extinct 2/3rds requirement and a regressive and out-of-date tax system, we are failing to keep up with the baseline costs of running our state. There could be no better metaphor for this civic negligence than an I-5 bridge literally falling into a river. Drowning government in a bathtub. 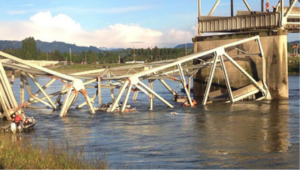 Last Thursday evening a truck carrying an oversized load hit a section of the I-5 bridge spanning the Skagit River. The bridge, listed as “functionally obsolete” by the Federal Highway Administration crumbled and fell into the water. The truck managed to make it across but two cars and three people were thrown into the abyss. Thankfully no one was killed. The most terrifying thing about this tragedy is how unremarkable the bridge was. According to a report by the American Society of Engineers, 366 of Washington’s 7,840 bridges are considered structurally deficient, and another 1,693 bridges are considered functionally obsolete. Together that’s one in four bridges in Washington State. On my daily commute I cross two. Many of these bridges were built during the Eisenhower era and are badly in need of upkeep; upkeep that has been stalled by our refusal to pay for it. A bit of background: Washington’s gas tax is a flat fee, not a percentage. In 2005 legislators last voted to raise our gas tax to 37.5 cents per gallon, where it sits today. Back then a gallon of gas cost $2.55. With gas hitting $4 a gallon and fuel efficiency standards going up, state revenue just isn’t keeping pace with need. House Democrats passed a transportation package dedicating $911 million to maintenance and preservation. To pay for it, they would increase the gas tax $0.10 over a period of four years. The bill is currently stuck in the Senate, where the Majority Coalition is opposed to any package that includes a tax increase. This knee-jerk refusal to raise revenue affects much more than our bridges. King County is currently legally unable to raise the revenue necessary to maintain Metro. Not broke, not living outside its means, but lacking permission from Olympia to pay for the things King County values. This is (ten) penny smart and pound foolish. A functioning Interstate system is crucial to our economy, as is moving people smoothly through our cities. Government provides for a lot of our needs, in ways that used to seem intangible. And it doesn’t do so for free. Hopefully this bridge collapse will kick off a conversation on our shared values, and how we’re willing to contribute. If not? I guess we get what we pay for.